Paternus: Rise of Gods, the first book in The Paternus Trilogy, is available for purchase through Amazon in eBook and Paperback formats, as well as free on Kindle Unlimited. Audiobook available through Amazon, iTunes, Audible US, Audible UK, Audible DE, and Audible FR, as well as other markets. 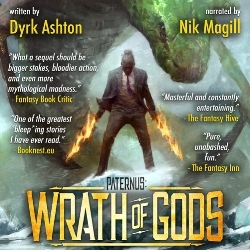 Paternus: Wrath of Gods, book two in The Paternus Trilogy, is now available on Amazon in eBook and Paperback, and free on Kindle Unlimited. Audiobook available through Amazon, iTunes, Audible US, Audible UK, Audible DE, and Audible FR, as well as other markets. 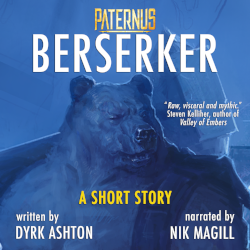 Paternus: Berskerker is a stand-alone short story framed as a "missing chapter" from Paternus: Rise of Gods. It tells of the time when one of the characters finally met his father, many centuries ago. Available on Amazon for $.99 or free for signing up to the Paternus Books Media newsletter. Also available in audiobook format on Audible US, Audible UK, Audible DE, and Audible FR, as well as other markets.